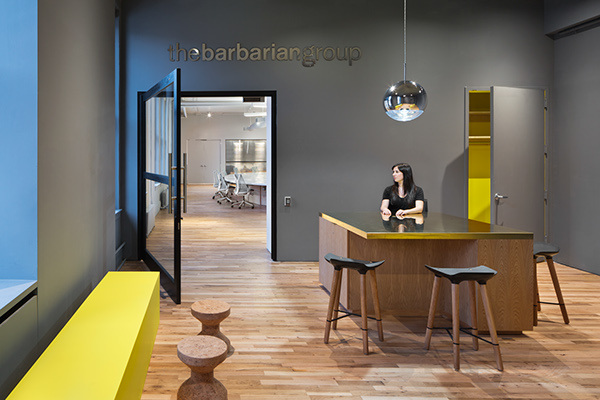 Our client, The Barbarian Group, creates consumer experiences for the digital world, and has blazed a trail exploring how technology can invigorate and empower people through connectivity. 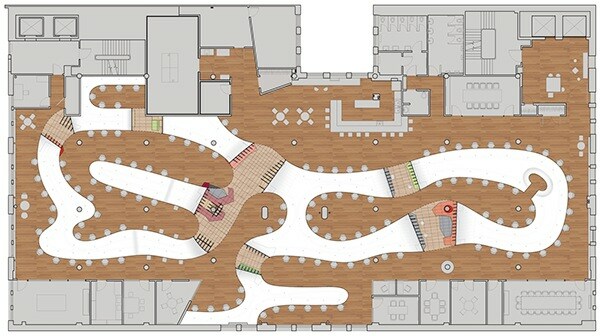 With a highly constrained budget, we adapted an existing 20,000 SF office space for a flexible community of 125 -175 Barbarians, recycling perimeter rooms and services for acoustically controlled spaces, while surgically clearing the central zone. 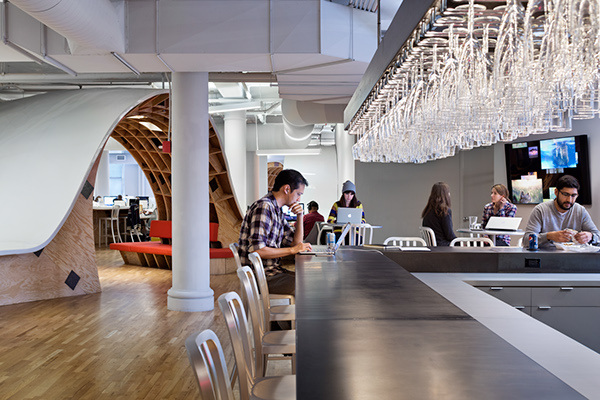 Conventional office tools are now largely redundant. 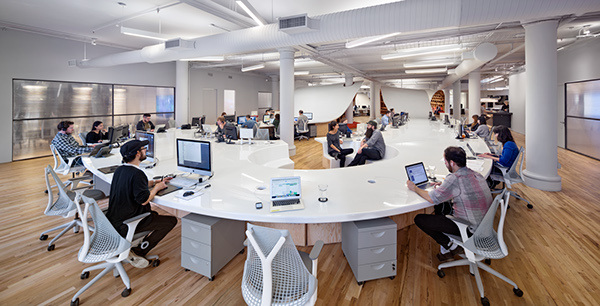 People need to connect to other people: they need flat surfaces to work on with laptops or monitors or other equipment, and easily accessible places to meet and collaborate. We got excited about the idea of massively simplifying this concept to show how radically different an office could be when you alter the ‘job description’. With these simple needs in mind, we imagined of a kind of endless table that connects everyone. The surface you work on should be the same as the surface your colleagues work on, and that surface could connect everyone in the company in a single mission. Like an electrical wire, the table surface itself becomes a medium for connecting and centering a community. 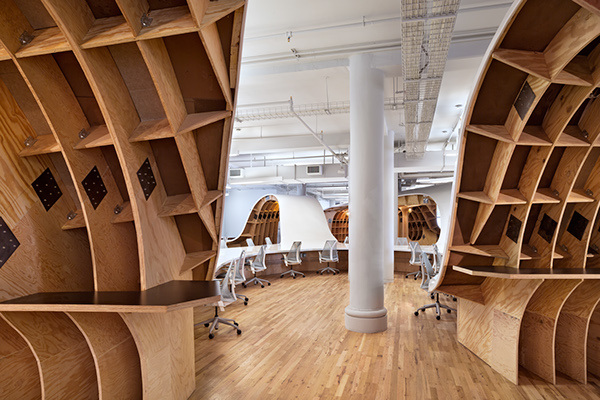 The plywood structure rises from the existing oak floor as pony walls supporting the table. Because the movement routes bisect the space, we lifted the table to fly over pathways and maintain surface continuity. 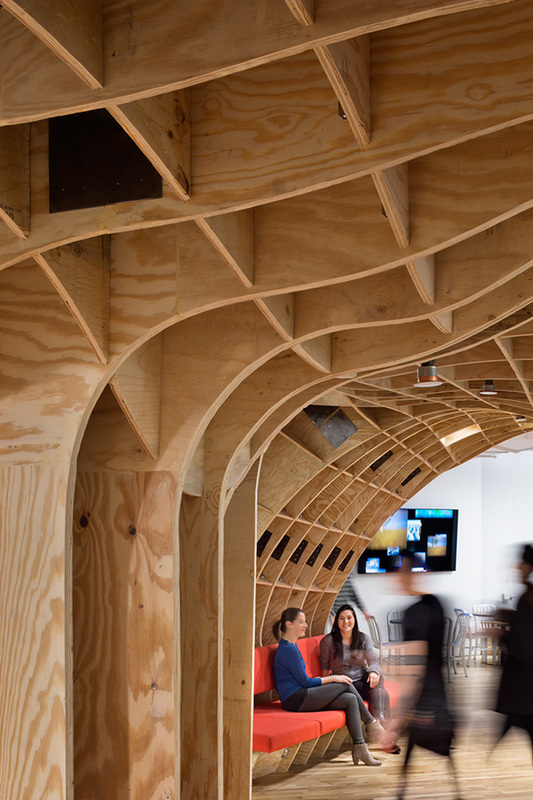 The resulting grotto-like spaces underneath these ‘arches’ are characterized by a vigorous plywood coffer structure and offer a variety of amenities. They can accommodate meetings up to 8 people, provide private focused workspace, or high counter workspace, and house bookshelves and other storage. The top surface of the table is an ethereal pearlescent white, with a clear epoxy coating, so the fluid nature is emphasized. 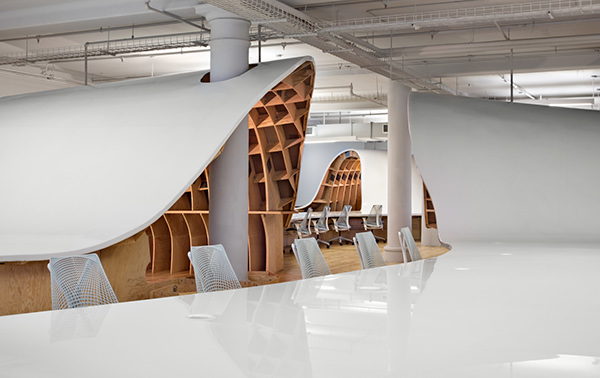 After being initially drawn by hand and then molded in a physical model, the plywood supporting structure was thereafter entirely shaped by the computer. A detailed computer model was constructed by the architects and analyzed by the engineer, and then laser-cut in sections off-site by robots. 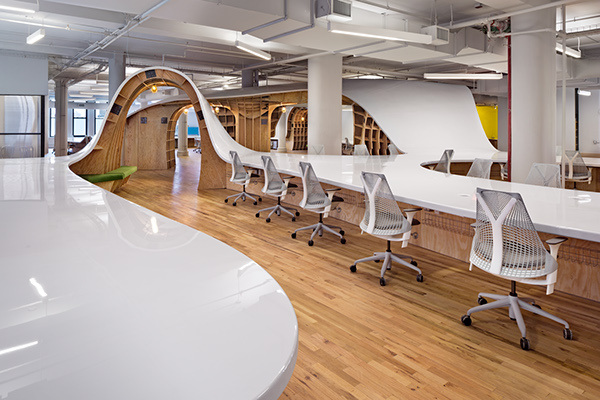 In its final form, the table is made up of 870 unique plywood panels, 4,400 square feet of table surface and 1,100 linear feet of perimeter edge surface with a starting density of 5’-0” linear foot per person.